Our integrated team work together to provide you with the highest levels of valeting and customer service in the country. Each member of our team plays an integral role in the service we provide. Find out more about each of them below. The lifeblood of our operation and the people that will make your vehicles shine. 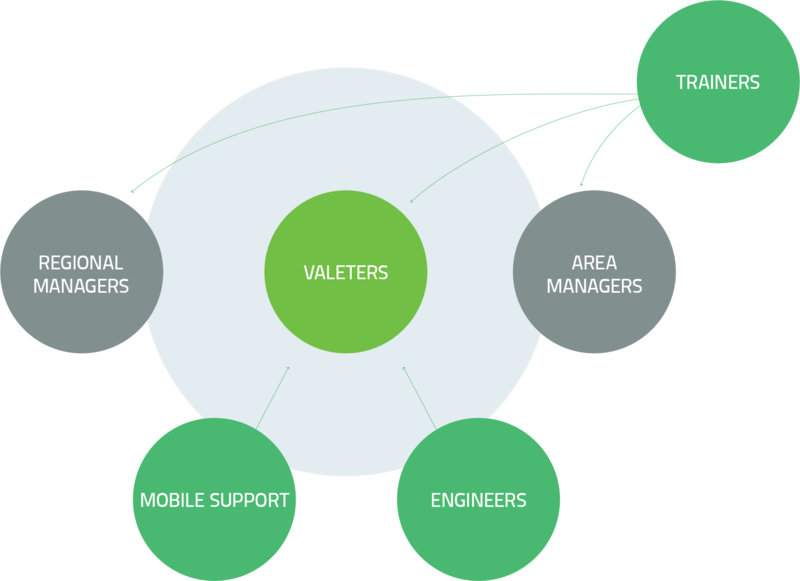 All of our valeters go through a rigorous recruitment process and are trained to our standards to ensure that we only provide the best. And because they work for NCC, you know they are committed to doing the best job possible. Spread across the country, our mobile support staff are here to ensure that valeting never needs to stop. With our fleet of vans, we’re able to provide emergency relief to all of our clients at 24 hours’ notice. Our Mobile Support Units cover holiday and sick leave, and can also be provided when there is increased demand. Ensuring quality, they make sure everything we provide matches the high standards we hold ourselves to. Our trainers make sure every new valeter we take on is up to NCC’s standard. Trainers are also provided to every new client we take on. They’ll work with you at your dealership to set up our valeting service and won’t leave until it’s finished and you’re satisfied. We employ our own engineers so we can deliver the quickest possible response times. Our engineers are on call 24/7 to ensure that if something does go wrong with our equipment, we can fix it quickly – causing you minimal disruption. With engineers covering the north and south of England, they’re never far away when a call comes in. Your quality assurance officers – the people who make sure all of our clients get the level of service they’ve come to expect from us. Our Area Managers play an integral role keeping all valeters and engineers in their area supplied. Spread across the country, you can be sure one is nearby if you should ever need them. Our regional managers oversee all operations, making sure our great service runs like clockwork – day in, day out. Covering the whole of the UK, our Regional Managers supervise and support area managers, and oversee all of NCC’s valeting services in their region.